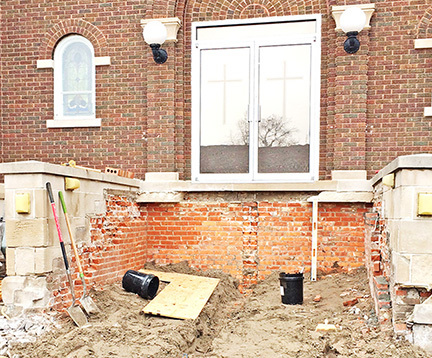 Steps leading into the entrance of St. Charles Catholic Borromeo Church have been removed and will be replaced after a generous donation from Jim and Sandra Kruger. The front of the local Catholic church should be back in use by the end of May. The steps are costing more than the church did in 1915. The worn, weathered and cracked stairs have marked the passage of time for St. Charles parishioners since 1915. The century-old steps have felt the tread of hundreds of brides and grooms, born the happy weight of a newborns carried in to be baptized, caught the tears of many funeral processions, and welcomed everyone for thousands of weekend masses. “The steps needed to be replaced because they were cracked and falling apart in different places,” the Rev. Keith Rezac said. The parish council saw the problem as well. Council member Carol Emanuel along with Jenni Peters began researching older buildings and renovations to see what could be done. Their search for the perfect stair led them back to North Bend and looking at the former North Bend Carnegie Library that was renovated by Jim and Sandra Kruger. They liked the old look of the steps that had been replaced there and decided to contact Jim Kruger and get advice. “We learned about precast steps which would allow us to control the color, appearance, and how it is made,” Emanuel said. Both Rezac and the parish council were happy to find a solution to have replacement steps that would look like the originals.